A great choice for environmentally conscious consumers, this toilet paper is made from 100% total recycled content. Durable and safe for all septic Systems, Green Heritage Bathroom Tissue is also soft and absorbent. Overall embossed pattern. Individually wrapped so rolls stay clean and dry in storage and during transport. Ideal for public restrooms as well as residential homes who like to stock up. Sheet size is 4.5 by 3.5 inches and there are 500 sheets per roll. 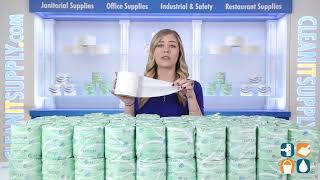 Includes 96 rolls so you will always have a back-up on hand. Orders yours today. Buy more and save more!